Windows Azure is a Cloud computing service from Microsoft. Although Microsoft has not been a keen supporter of free and open source technologies but it's Windows Azure cloud hosting platform is capable of hosting PHP based web applications using the PHP Interopbridge. This means you can get all the Open source goodness of Drupal, Joomla, WordPress, phpBB and phpMyAdmin on the Windows Azure platform! In this article we will tell you about a tool called the Windows Azure Companion using which you can easily deploy a large number of CMSes such as Drupal, Joomla & WordPress on your Windows Azure platform. Using the Azure companion is simple. There are just three steps to getting started. 1. Download the Windows Azure Companion package. 2. Deploy (Extract) the necessary Azure Companion packages to your Windows Azure server account. 3. Now, you can custom feed deploy all your PHP applications and other PHP based CMSes. 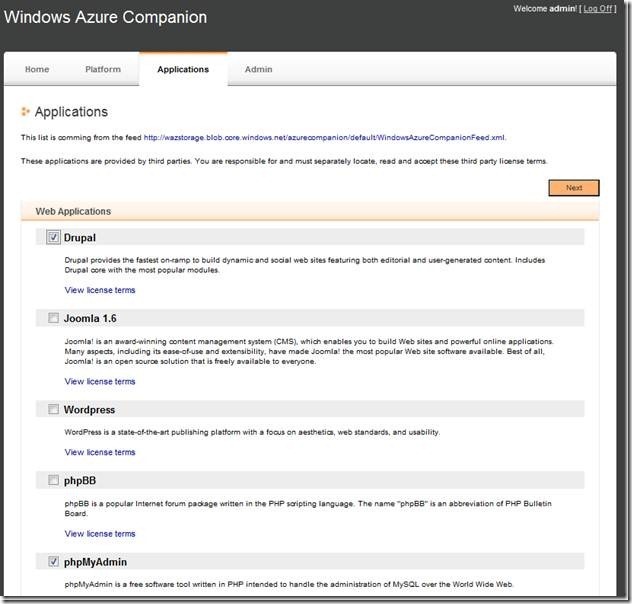 The screen shot below shows the list of available PHP based frameworks which can be installed on a Azure server using the Windows Azure Companion. You can also install Memcached on Windows Azure in order to provide a formidable caching mechanism for your web applications on Windows Azure. For a detailed deployment and installation guide, you can see this. You can also check out this screen cast on how to install Drupal 7 on Windows Azure with the Windows Azure App Companion Tool.